SCVHistory.com LW3351 | William S. Hart | Triangle Film Corp. Exhibition Invoice for 'The Apostle of Vengeance,' More, 1916. • "His First False Step" (Keystone Film Co. 1916) starring Chester Conklin and Mary Thurman, Mack Sennett, producer. Invoice is 6x7 inches, parchment. 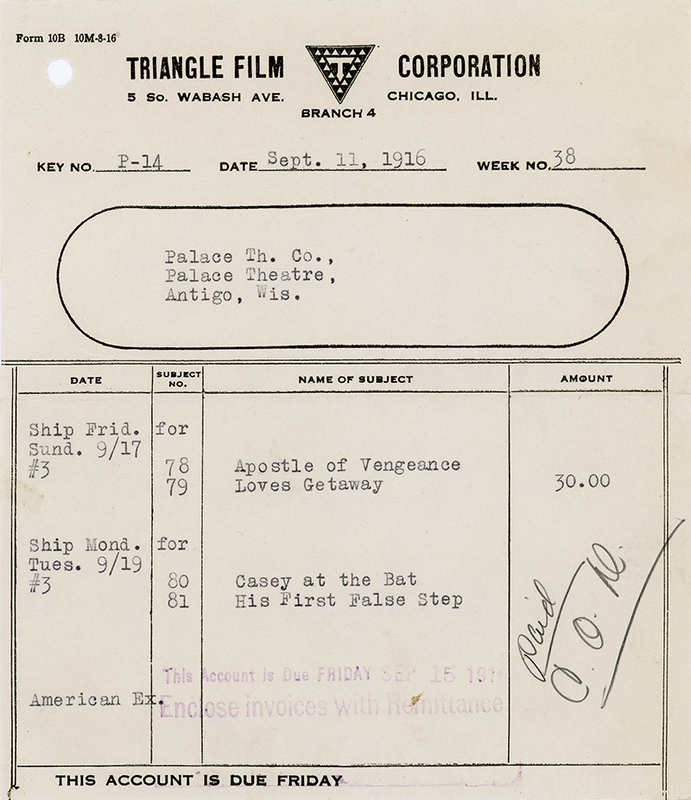 This same year (1916), Aitken created Triangle Film Corp. as a film distribution company, spinning it off from his production company in order to raise capital to keep his picture-making business alfoat. He lived to regret it. Read this and this. About "The Apostle of Vengeance." From Koszarski (1980:46): Produced by the Triangle Film Corporation under the supervision of Thomas H. Ince; distributed by Triangle; in production February 3-March 24, 1916; released June 25, 1916; production cost, $15,281.89; five reels. Directed by William S. Hart; story and screenplay by Monte M. Katterjohn; photographed by Joe August; assistant director, Clifford Smith. Credited Cast: William S. Hart (David Hudson); Nona Thomas (Mary McCoy); Joseph J. Dowling (Tom McCoy); Fanny Midgley ("Marm" Hudson); John Gilbert (Willie Hudson); Marvel Stafford (Elsie Hudson); Gertrude Clair; "Rags" (as himself). Not credited: Jean Hersholt. Synopsis (from Motion Picture World, June 24, 1916): David Hudson is a young minister living in Vermont. He is the son of a family of Kentucky feudists. The mortal enemy of the Hudsons is the McCoys. At the very time the young minister is being honored by a call from a richer and more influential parish in the North his father is killed in a pitched battle between the Hudsons and the McCoys. The same mail that brings the young minister word of his promotion brings him a letter from home, telling him of the killing of his father and asking him to return and aid in the extermination of the McCoys. "Dave" Hudson declines the call from the church in the North and goes back home, but not to murder but to preach the gospel. His family is so enraged at his refusal to take up arms against their enemy that they turn him from the house. He takes up his residence in a little mountain cabin and puts out handbills announcing he will preach the following Sunday on "Love Thy Neighbor." Chance gives him the opportunity to rescue Mary McCoy, the favorite daughter of the Hudsons' worst enemy , from the brute who attacked her. A little later the oldest McCoy boy attacks little Elsie Hudson and hurls her from the bridge into the river, where she would have been drowned had not Dave seen her floating downstream and rescued her. The attack of a McCoy on a defenseless girl is more than Dave can stand and he renounces for the moment his ministry and goes forth to kill the man who had attacked his sister with his bare hands. Straight to the McCoy house Dave makes his way and there learns that the elder McCoy, having wrung a confession from his son, had turned the boy out and disowned him. Dave starts back to the woods in search of the man he sought. A terrific storm breaks and at its height Dave begs the God he has served to bring the man he was after into his power. As though in answer to his prayer, young McCoy falls down an embankment and lands at the very feet of the man who has sworn to kill him. As Dave's hands close on the man's throat, his victim begs for his life to be spared and makes his plea "for God's sake." The words strike Dave hard and he unloosens (sic) his grip on the man's throat. Dave has returned to his preaching. He has allowed the man he sought to escape when he had him in his very grasp, but the effect had been better than if he had killed him. A feeling of friendship sprang up between the families that had been enemies for twenty-five years. Dave eventually marries Mary McCoy and the oldest and bitterest enemies in the two families become friends. Review (from New York Dramatic Mirror, June 24, 1916): We fancy that Mr. Katterjohn had Hart in view when he wrote his scenario, for there are few other men that are capable of lending such strength to the character as does Mr. Hart. LW3351: 9600 dpi jpeg from original invoice purchased 2018 by Leon Worden.